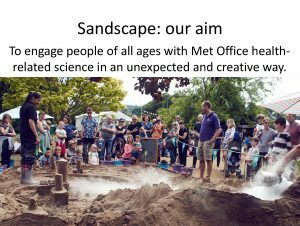 The Sandscape project receives an Honourable Mention for its innovative, clever, interactive and visually stimulating approach, which combines hands-on demonstrations, entertainment and plenty of fun in order to increase public interest and awareness. Budding sand sculptors were shown how to fashion elaborate structures from sand and water – creating a landscape with bridges, towers, factories and even stadiums. As they worked they reflected on what makes a healthy city, discussing with the scientists how the natural and built environments influence air quality and circulation and how this impacts our health.